Paul Drye posted: " What it was: One of the products of 1991 study by Boeing for a Mars mission vehicle. Technologically it was the most conservative of the possible craft they suggested, relying entirely on cryogenic propulsion, but the trade-off was a hair-raising missio"
A schematic of the STCAEM-CAB Mars space vehicle. The twin heat shields (the scoop-shaped structures) were needed as the craft was too massive to aerobrake in one piece even after the TMIS was jettisoned. 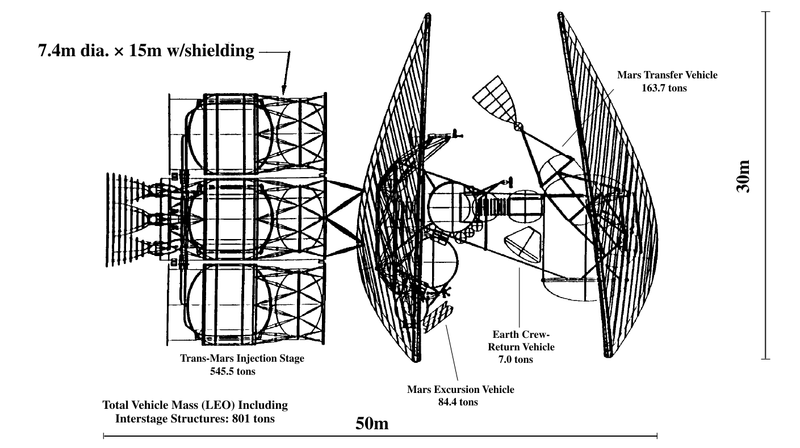 The MEV and MTV would separate before the Mars encounter, aerobrake and enter orbit separately, then rendezvous and dock while high above the Red Planet. Public domain image by the author, based on one published in Space Transfer Concepts and Analysis for Exploration Missions, Implementation Plan and Element Description Document (draft final) Volume 2: Cryo/Aerobrake Vehicle. Click for a larger view. What it was: One of the products of 1991 study by Boeing for a Mars mission vehicle. Technologically it was the most conservative of the possible craft they suggested, relying entirely on cryogenic propulsion, but the trade-off was a hair-raising mission profile including a hard aerobraking maneuver at Mars. Details: From 1989-93 the then-President of the United States, George H. W. Bush, put forward a proposal to (among other things) send astronauts to Mars. While NASA had always kept Mars contingency plans up to date since even before Apollo 11, this was one of the few times where it looked for a while like they might actually be able to put their plans into motion. 1989 they produced a strategic plan known informally as the "90 Day Study" and then set various contractors to work on its different goals. One of these was "deliver cargo reliably to the surfaces of Moon and Mars, and to get people to these places and back safely". Boeing was the contractor primarily concerned with this this one, and performed an initial study in 1989 before amplifying it in 1991-92. For Phase 1 of the later study they worked their way through the pros and cons of several different approaches to crewed Mars missions for NASA to choose between, most of which involved novel propulsion systems like nuclear rockets and solar-electric ion engines. One was more conventional though, closely hewing to NASA's own baseline for the mission, and was presented first in their Phase 1 final study. All the Mars craft were assigned the clumsy name of the study, Space Transfer Concepts and Analyses for Exploration Missions (STCAEM), and differentiated by their propulsion method. The first craft was accordingly the STCAEM-CAB, the final thee letters standing for "cryogenic/aerobraking". The Mars mission was placed firmly in the context of the whole Space Exploration Initiative, not least because the vehicle in question was going to ring in at a whopping 801 tons. No conceivable rocket was going to lift it in one piece, and so the SEI's space station Freedom was to serve as a base for the in-orbit assembly of the massive ship. A Moon base was also assumed, the First Lunar Outpost<https://falsesteps.wordpress.com/2013/02/02/flo-the-first-lunar-outpost/>, and served two purposes insofar as Mars was considered: as a test bed for the various technologies, and also a place to put a deliberately isolated habitation module that would simulate a long Mars mission without leaving the immediate vicinity of the Earth-Moon system. The proposed Shuttle-Z in what was charmingly called the "Ninja Turtle" configuration--lifting the STCAEM-CAB's two aeroshells off Earth and to Freedom. Public domain image from NASA, same source as previous. Click for a larger view. Using what was called the Shuttle-Z (a variant on the Space Shuttle wherein the orbiter was replaced almost entirely with 87.5 tons of payload, leaving only the main engines, the boosters, and the iconic orange tank), eight trips would be made to Freedom with various components of the ship. After assembly, the STCAEM-CAB would consist of several sections, the largest of which was the Trans-Mars Injection Stage (TMIS) at 545.5 tons. Fuelled with liquid hydrogen and liquid oxygen, the cryogenics referred to in its name, the four-engined TMIS would push the entire craft into a Mars-bound trajectory before being jettisoned. Boeing studied a number of missions that could be flown and came to the conclusion that the relatively less efficient cryogenics propellants would work best when Mars was at opposition, leading to a 580-day mission. 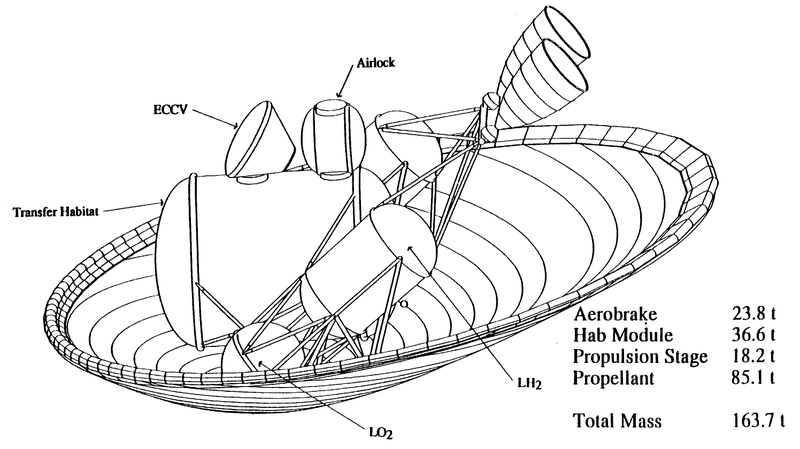 Missions for Mars have often included odd wrinkles in their plans to help cut down the amount of propellant needed to pull them off; for example, the Integrated Program Plan's mission avoided a circularization burn at Mars, leaving it in an elliptical orbit that made the lander's descent to the surface start at a higher speed—but better to have to slow down the relatively small MEM<https://falsesteps.wordpress.com/2016/09/17/the-mars-excursion-module-one-more-small-step-integrated-program-plan-part-iv/> than the entire interplanetary craft. In the case of the STCAEM-CAB the trick was unusual enough to warrant mention. For the bulk of the outbound trip, the two other main components of the craft, the Mars Excursion Vehicle (MEV) and the Mars Transfer Vehicle (MTV), would stay docked, with a small transfer tunnel between the two of them. In this configuration it would serve as the habitation for the crew of four astronauts, with the MTV's crew module being 7.6 meters by 9 meters. This would give each astronaut something on the order 50 cubic meters to live in, with another 50 for everyone to share in the MEV, at least on the way out. With fifty days to go before Mars, however, the two would separate (the crew staying in the MTV, which had the capability of returning them to Earth) so that they could each dive into the Martian atmosphere at closest approach and slow down behind their individual heat shields.The MEV would brake first, 24 hours before the MTV and crew, giving Mission Control a chance to observe Mars close up and decide if it was safe for the second aerobraking maneuver. Side and front views of the MEV after jettisoning its aerobrake and landing on Mars. Public Domain image from NASA, same source as previous. Click for a larger view. 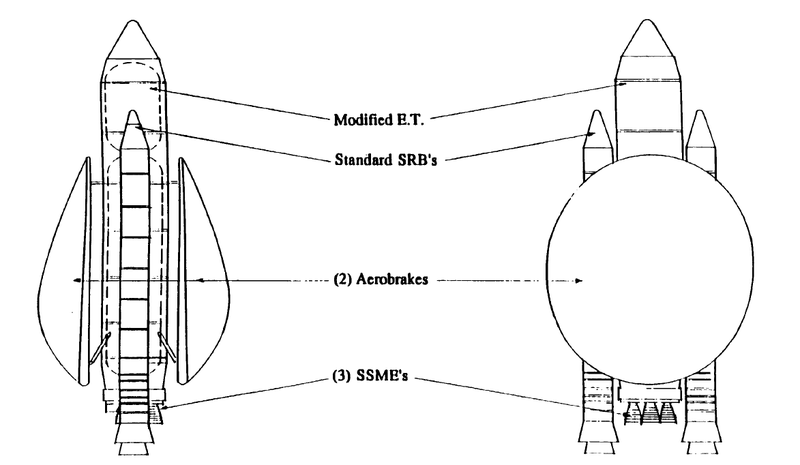 This approach also had the advantage of making the aerobraking shells smaller, as even done this way they approached the length of a Shuttle Orbiter (30 meters, as opposed to 37.2 meters) and so the shell for a singular craft would have been impossible for a Shuttle-derived stack. After both had aerobraked and entered orbit, they would dock again, the crew would transfer to the MEV, and then descend to the surface. 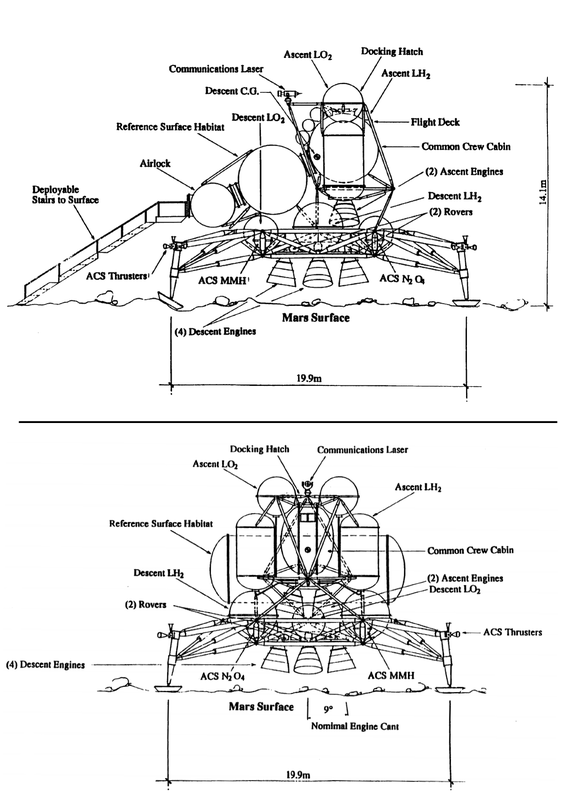 Several landers were mooted, from one with a 0.5 lift-to-drag ratio (the favored option, pictured at left), one with a 1.1 ratio, and a biconic lander that was going to require a launcher back on Earth that had a diameter of 12 meters(!). The astronauts would stay on Mars for 30 days, then a subset of the MEV (the third and uppermost of the circles in the MEV image shown, as well as the tankage underneath it) would launch skywards again to dock with the MTV. This would in turn get them back out of Mars orbit and home to Earth, where they would aerobrake again to bleed off some velocity and enter Earth orbit. The crew would finally enter an 3.9 meter wide by 2.7 meter tall Apollo-like capsule for re-entry to somewhere in the ocean. Optionally the MTV would remain in orbit and be refurbished for another journey. Boeing scheduled out the launch of the first Mars mission three different ways. One was a "Minimum Program", intended to do no more than meet the 90 Day Study's stated goals, one was a "Full Science Program", while the last was an eyebrow-raising "Industrialization and Settlement Program". The latter was on Mars by 2009, and saw a permanent Mars base with 24 inhabitants in 2024, some astronauts staying there for years. The science-oriented program made it by late 2010, and saw a permanent lunar base of four (the settlement plan saw 30!) but only a periodically inhabited Mars base of six astronauts. The minimum options saw a first Mars landing, by coincidence, in 2016. It had neither permanent Mars or Moon base. As for the cost of each, Boeing includes various graphs but only gives one number, for the Industrial and Settlement Program: an eye-watering $100 billion from 2001 to 2036, with a peak of $19 billion in 2020. What happened to make it fail: Well, "$100 billion...with a peak of $19 billion" for a start. While the Bush Administration was obviously looking for their own version of a "Kennedy Moment" when they announced the Space Exploration Initiative, they were not all that keen on actually paying for it. Couple that with extreme hostility from Congress anyway, and the SEI's ultimate goal of Mars mission was in trouble right from the start. Likewise NASA blew it by proposing grandiose plans like an 800-ton Mars ship, the full space station Freedom, and the First Lunar Outpost<https://falsesteps.wordpress.com/2013/02/02/flo-the-first-lunar-outpost/>, to the point that the backlash led to the "faster, better, cheaper" era under Dan Goldin (which had its own problems, but that's another story). Boeing even spent some pages in Phase 1 trying to determine returns on investment and the like, with some of their anxiety at the cost coming through in their prose. This includes an unflattering comparison to the development of the Alaskan oil pipeline and the investment in supertankers during the closure of the Suez Canal from 1967-75. As far as the STCAEM-CAB in particular was concerned, it also suffered from being "good under most circumstances but never the best". Boeing preferred the Nuclear Thermal Rocket variation, and focused on that going forward from Phase 1 of the study, even though Goldin had been NASA administrator for a year and a half by the time their final work on the project was completed. The NTR variant was certainly not going to go ahead thanks to NASA's new focus, and the CAB had already fallen by the wayside. Ultimately, though, this mission suffers from the same problem as the Integrated Program Plan's Mars Mission<https://falsesteps.wordpress.com/2012/08/08/mars-expedition-1969-nasas-waterloo/> from the early 70s. It existed down near a long line of large programs, few of which actually happened. You need to join back up several links in a chain to get to the launch of this spacecraft. Ultimately, quite a few things would need to change for STCAEM-CAB to make its trip, making it quite unlikely under any circumstances. Unsubscribe<https://subscribe.wordpress.com/?key=a9936435d2eec774465d9fd42a099e37&email=ljk4%40msn.com&b=LuP40mNQH_%2FYApKVp6K%5B5x2OFnwRx%26-7%5De9S-lA%2F%2F%2FcI%5DfhijH%5B> to no longer receive posts from False Steps. Change your email settings at Manage Subscriptions<https://subscribe.wordpress.com/?key=a9936435d2eec774465d9fd42a099e37&email=ljk4%40msn.com>.